For prisoners of war, the first 24 hours are the most dangerous, Sen. John McCain, R-Ariz., tells The Early Show co-anchor Harry Smith. His remarks come one day after Pfc. Jessica Lynch was rescued by commandos in Iraq where she was being held as a prisoner of war. Joy over her recovery has been tempered by the discovery of 11 bodies at the hospital where she was found and the belief that some of the remains may be Americans. "One of the reasons why it's the toughest, and was in '91," says McCain, who was a POW in Vietnam for five years, "is because you're not in the hands of the authorities who at least are somewhat inclined to observe their rules of war. So that's very dangerous." Of his imprisonment in Vietnam, three years of which were spent in isolation, McCain said, "Most of the POWs we lost in Vietnam were being transported right after capture to Hanoi. So that part of it is dangerous. It's a shock to your system, obviously, and usually in these situations you're wounded or injured in some way." 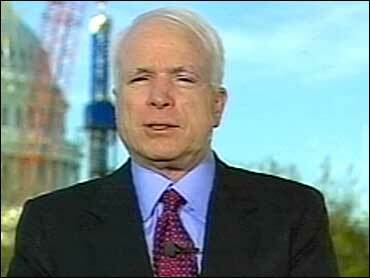 McCcain favors sending a clear message to Iraq. "The point here, Harry, is that we tell the Iraqis that we don't know exactly what they've done to our prisoners, but if they have harmed them, we will track them down, and we will hold them responsible. They'll lose this war. We will find them wherever they are. Unless they treat those prisoners according to the Geneva conventions," he says. While in captivity, McCain says, he dreamed of being rescued. "Two things I dreamed of. One was being rescued. And the other one was that I would escape and get to the Swedish embassy in Hanoi and they would take care of me for the rest of the conflict. "In fact, we would have plans to escape, and as you know, there was a daring raid made on a camp outside of Hanoi, which frankly although there was no POWs there, was a tremendous lift to our morale and spirits when we heard about it," he recalls. Watching video of the rescue of Lynch and hearing reports that she fought fiercely and shot several Iraqi soldiers before her capture, McCain says, "I don't think there are too many Americans that are familiar with the military that don't recognize that women are superb. They're fighter pilots, they're wonderful contributions. It's a sign of the contribution that all Americans will make to our military and can and do." McCain's assessment of the war is that it is going well. "If two weeks ago you'd have told me that we'd be on the outskirts of Baghdad, I'd say that it's certainly a successful operation. I think that's an obvious answer," he says but offers a word of caution for the challenges ahead. "The weapons of mass destruction, and whether they will be used or not. Will the Republican Guard fight inside Baghdad? How long will it take us to pacify towns like Basra, cities, which still remain not totally in our control? What's going to happen to the oil wells in the north? So there are a lot of unanswered questions. But I think overall we can be proud," he says. He says that succcess is based on "incredible technological capability, but also the superb young men and women that perform so magnificently."